There always comes a time when one just needs insignia and serial number/letters to complete a project. It may be due to no specific decals being available or one just wants to do a certain aircraft, or one wants to replace those provided by the kit. 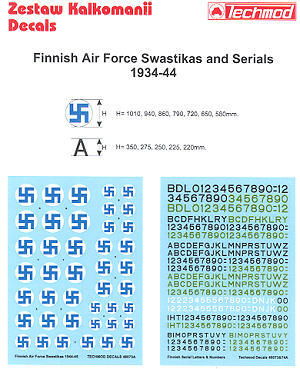 This set offers three large sheets in 1/48 scale covering the Finnish Air Force from 1934 until 1944. 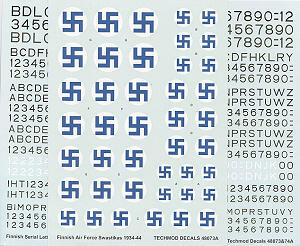 You get one sheet of white background insignia and two identical sheets of serials numbers. These latter items are in three different shades; one black, one olive green, and a small selection in white. The white are for the Ju-88 and Do-17, the only aircraft that carried serials in this color. There are enough in several sizes to do just about any aircraft you can think of. Included is an instruction sheet that shows the standard placement of these markings. The Finnish AF was quite specific on placement so you can use this guide with confidence.